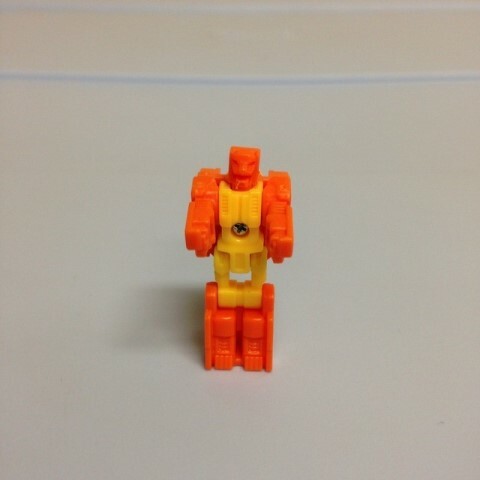 Well, here we are with a new Titan Master for the Titans Return line � Sawback, a.k.a. Lione. 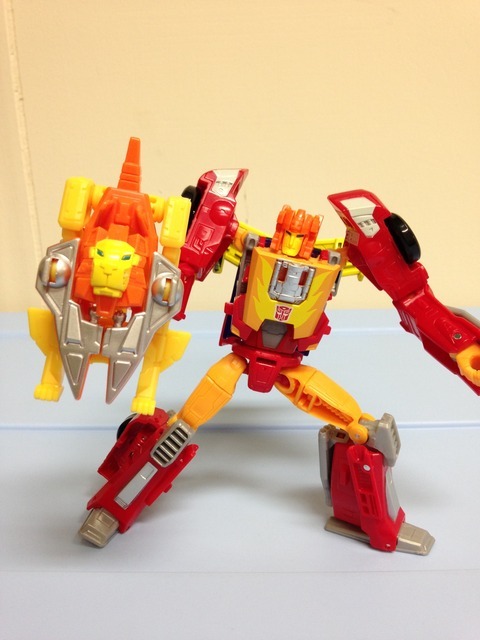 Lione was a Japan only character and toy, debuting in the Headmasters cartoon and seeing an standalone exclusive release, respectively. Lione�s cartoon appearances seem to be only from two episodes from what I gather. The original toy is a rarity � apparently the real deal goes for obscene amounts of money on the secondary market these days. For these reasons, I give the design team at Hasbro/Takara a major thumbs up for bringing these types of characters to today�s market; this is something you definitely would not have seen even a few years ago. Lione�s lion mode is the best of the few modes this guy has, in my opinion. The lion looks pretty imposing, and has a good amount of detail. The color palette (which is consistent in every mode) is yellow and orange, with a tiny bit of blue for the eyes and silver on the �wings�. The lion stands well enough, but doesn�t do anything else that�s noteworthy. At least the Titan Master plugs into the back of the lion head very easily and stays snug. The only major problem here is the lion has a gaping hole in his back. And he�s got a stubby tail. Oh well. Unplug the Titan Master, flip the lion upside down, close the head and open the wings. That�s about as tricky as it gets for these small guys. The Titan Master sits in the �cockpit� of the jet, looking over a tiny windshield. Otherwise, you�ve got a boxy jet with cat legs for tail fins. At least there are a couple little guns to shoot from the wings. Meh. Remove said Titan Master, flip the back legs down and rearrange the wings to get into shield mode. Honestly, having a shield mode is pretty neat for use with various Titans Return figures, as it uses a 5 mm peg for attaching it to fists. The downside? The peg only works on the underside of another figures hand. So while I thought Lione would pair well with Hot Rod in terms of color palette, you can�t use him with Hot Rod�s arm design. Furthermore, the peg sits rather close to the shield�s body, so having the shield rest on a forearm (as shields do) is unattainable on some figures. What could have been great weapon mode falls a little flat. 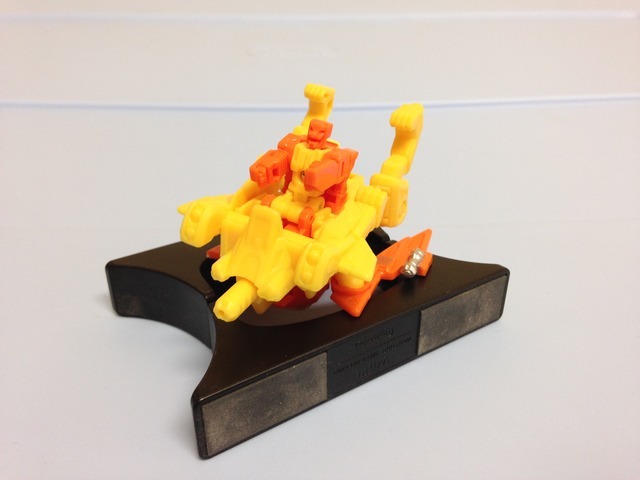 Lione�s robot mode is all bland plastic � you�ll find no paint here. A yellow torso with an orange head, arms and legs. At least his little head looks like a lion as well� so that�s neat. Lione features a long, yellow face with blue painted eyes. He�s got somewhat of an orange plastic �helmet�, but overall the look is pretty good and quite spot on to the rare original. I like how the eyes are somewhat slanty, giving him a lion-like look. Plugging him into other TR figures is easily, but the snugness of that plug will vary from figure to figure. He�s pretty wiggly in my Hot Rod, but fairly snug in Brainstorm. Choose wisely. Transformation Design: 3. Not a whole lot of anything noteable or interesting. Durability: 9. The plastic is good, nothing worrisome. Fun: 4. If the shield were a bit better designed, this would be cool. And the jet mode is terrible. Aesthetics: 7. 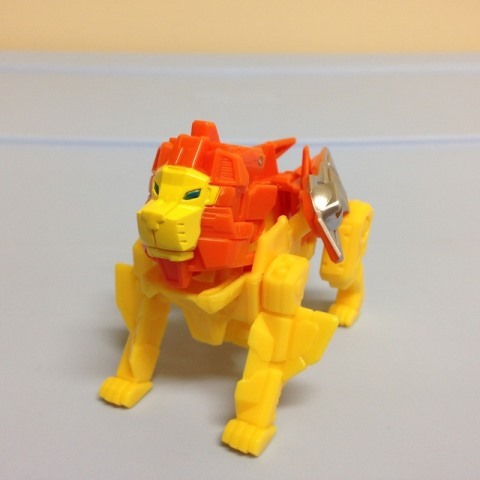 The colors are nice and bright and the lion mode looks great (if you ignore his hollow back). Articulation: 5. Well, he�s got joints where he needs them for a Titan Master. So, average? Value/Price: 6. As a standalone toy, Lione would be a poor choice. If you�ve got other TR figures laying around, $5 isn�t too bad for an impulse buy. Overall: 6. I honestly can�t say you need this guy. He�s your average Titan Master, and pretty cheap. He gets an extra point for being quite a rare figure. He would be an easier sell if the shield and jet modes were better designed.